No one loves you as much as I do. No one has ever cared for you and wished good for you as much as I have. I have been with you through your years of turmoil, months of heart break and days of sullenness. I have seen you crying for hours and musing in bed on those dark, long nights. Trust me, I have seen you at your worst. I have also known you when you are at your best crazy self – laughing right after bouts of weeping, dancing bhangra-style in a pub on an English song, cracking silly jokes in a group at inappropriate times and most often saying things that shouldn’t be said. But my most memorable experiences with you have been in times when you are at your best beautiful, kind, determined self – when you walked for hours in the scorching hot month of June on never-ending Gurgaon roads looking for an internship opportunity, when you put aside your own important tasks to make your friends (lovers) meet and communicate, when you turned around a negative situation into a positive one with your unshakable faith, when you saved somebody else and bore the brunt on their behalf. I can give you hundreds of such examples where you stood up for what you thought right. Do you know what your biggest strength is? It is your faith in life. It is your belief that people are good. It is your zeal to live and be happy and to continually create happiness and life long memories. You have your weaknesses too – impatience, impulsiveness and your inability to do a thing without involving your heart in it. But I would say as long as you are not harming anyone, you are fine with the these incapacities. Everyone comes with their own set of uniqueness. You have yours too. Simply harness it a little more and you will have the world at your feet. Grow old fearlessly. Make your face habituated of smiling even when it goes tooth-less. Make friends instinctively. Be with people who make you feel good about yourself. Love passionately. Love without passion isn’t your kind of love. Live happily. Happiness is found along the way. Enjoy the journey called life. And finally, sleep soundly. You will never know the tremendous power of sleep unless you sleep like a donkey. Remember I am always there for you because I reside inside you, unlike the others. So here I wish my favorite woman a very happy 35th birthday. 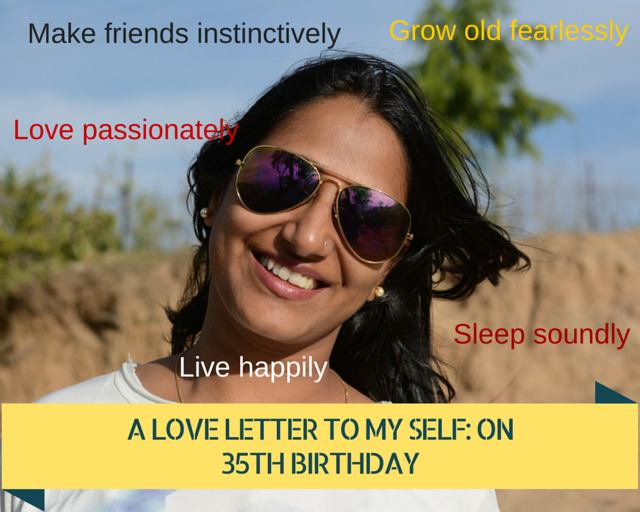 Do not get scared of being 35. First, you still look like a 26 year old (unless Pahal stands next to you) and second, 35 means being as charming and flavorful as an old, vintage whisky. If at all, you ever feel low and I am not of any help, look at the man in the picture below. He is my best alternative and the second person who loves you the most. Or else kiss the sweet girl in the photo. She is my best gift to you. And yes you do look like 26 …. pls let your readers know abt your BirthDay celebrations via next post. Hi Sandhya, getting a compliment on beauty from a beautiful woman herself is an achievement. 🙂 Thanks a ton! You guys are the back bone of Womanatics. Thank you for all the support. Happy birthday,always have the same zeal. Good luck n god bless.